First established by Glenn Nelson in 1955, Glenn’s Auto shop has been bringing Federal Way top of the line service for decades. A family owned business, our priority is the welfare and satisfaction of our clients. Read more about owners Mayumi and Aaron, and why Glenn’s Auto should be your next and last stop in auto services. Mayumi and Aaron are excited to announce that they are the NEW OWNERS of Glenn’s Auto Repair! Mayumi and Aaron purchased Glenn’s Auto on June 14th, 2017. Their main focus is to make Glenn’s the ‘GO TO’ shop in Federal Way and offer the best customer service in town. If you keep in touch, you will see lots of exciting changes coming! Glenn’s Auto was established way back in 1955 by Glenn Nelson. His hard work and dedication to customer service and community involvement progressed Glenn’s Auto to being the top shop of Federal Way for many years. His ethics were high and his commitment to his family and community were seen by all. Glenn eventually handed his shop over to his Son and Daughter in Law back in 1985 when the current location was built. The Motto of this shop has always been “take care of the community and the community will take care of us.” We are dedicated to live by this same motto and make the Nelson family proud of their Legacy. Mayumi grew up in Federal Way and graduated from Decatur High School in 1986. She also lived in Twin Lakes Golf Course for 16 years. She has 2 girls who also graduated from Decatur High School and a son who went to Lacota Junior High. In 2011, she met Aaron and they currently live in Bellevue with their blended family of 5 kids. Mayumi’s mom and stepdad have been residents in Marine Hill’s for the past 28 years, so Mayumi is never more than a short drive away. Aaron grew up on the Eastside in Kirkland. He has two young boys ages 8 and 12. Aaron has been in the automotive repair business for the past 17 years. He currently owns one auto shop in Redmond, AA Auto Service Center and another in Kirkland, Price Brothers Garage. Aaron has learned that to run a successful shop you must give your customer what they expect: Quality Repairs, Excellent Customer Service, and Fair Prices. With this philosophy, he has won the King 5 Best of Western Washington Best Auto Shop in Redmond two years in a row, and has been honored as AAA TOP SHOP in both shops for 9 consecutive years. Glenns Auto Team consists of Norm Mexiner our service manager. He was with the previous ownership for the past 2 years. Norm loves people and has been in the automotive business as an owner for 35 years before coming out of retirement to join the Glenn’s Team. 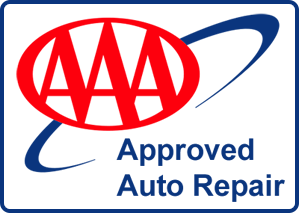 Maury Sanchez is head technician and is ASE Certified. There is not much Maury can’t figure out. Maury has been with Glenns for the past 7 years. Brian Pritchard joined Glenn’s May of 2017. He is a great tech with outstanding customer service skills. Lastly we have Rob Huehnerhoff. Rob came on board with the new owners and has been a Master Technician for the past 25 years. If Rob can’t fix your car no one can! We also are proud to say that we welcome all pets! 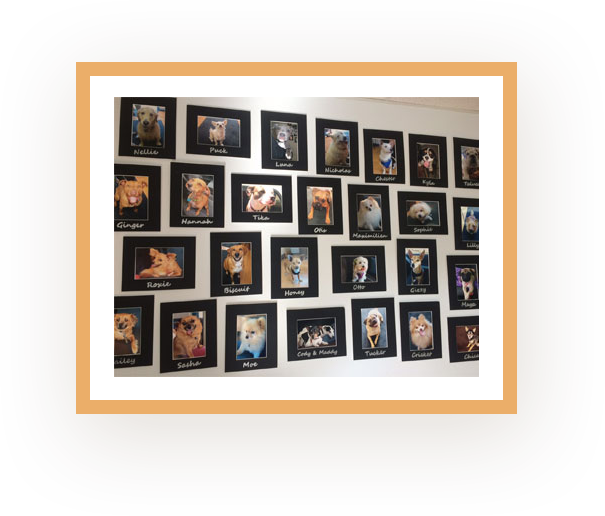 Every customer's pet is a welcome addition to our wall.